The total Procedure time is approximately 2 hours. 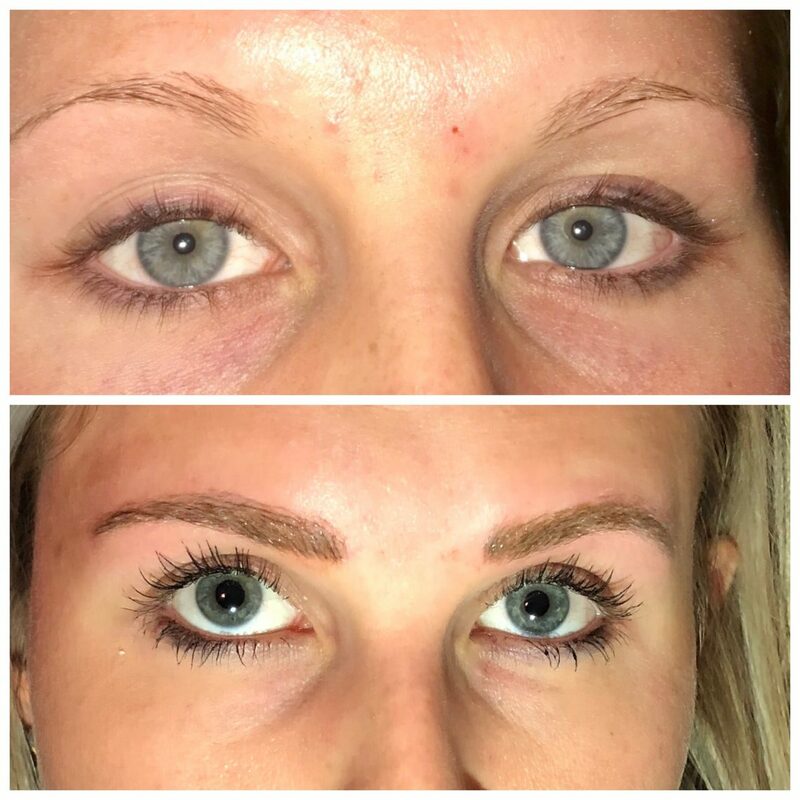 This allows time for eyebrow mapping, pre-numbing agent and eyebrow shaping & pigment color choice. 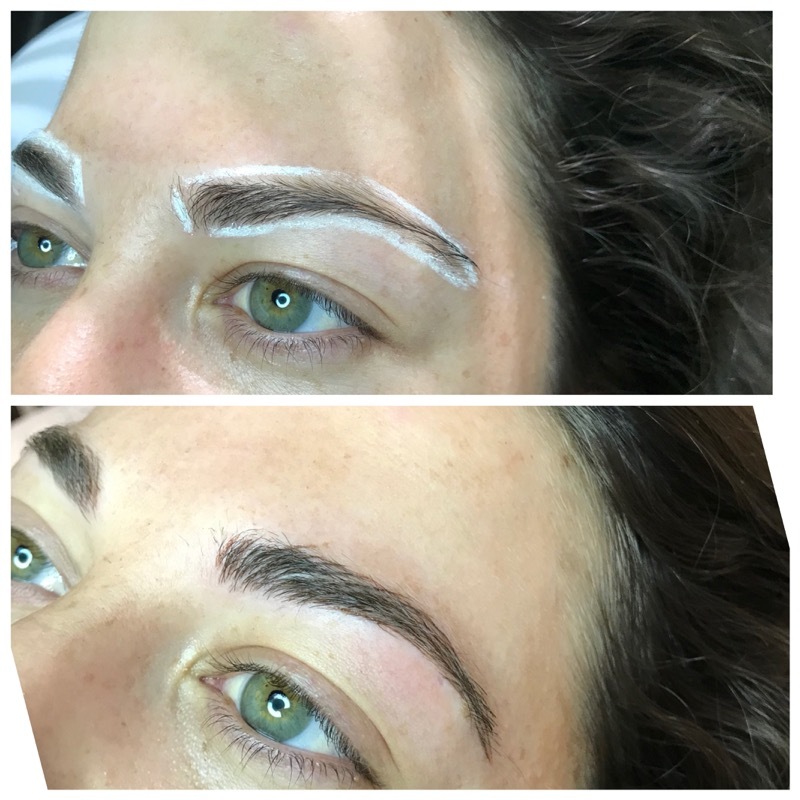 Actual Microblading time per procedure is usually around 1 hour. There is some discomfort and has been compared to tiny scratches on the skin. A pre-numbing anesthetic is applied to the skin prior to the procedure. 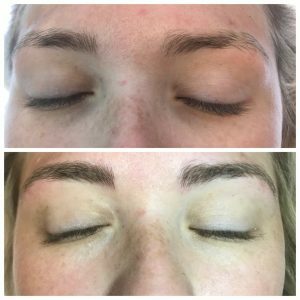 Immediately after the first pass of brow outline, topical procedure anesthetic is applied and is quickly absorbed for an added comfort. You cannot expose your healing skin to hot tubs, chlorinated pool, saunas, direct shower spray, tanning and long periods of time in the sun for two weeks. As well as no makeup or face cleansers on the treated area. Touch-ups vary with each person and how they retain the ink within their individual skin type. 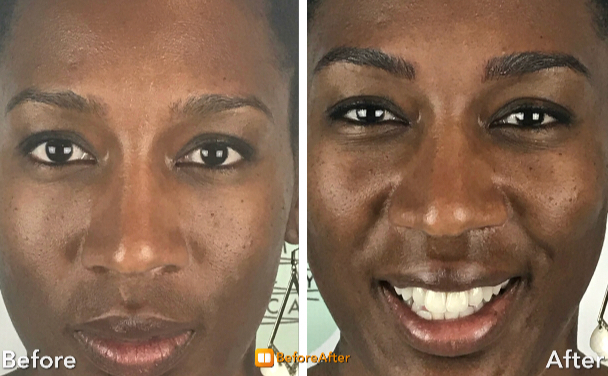 Also, aftercare makes a huge impact on the life of your 3D brows. You cannot have a touch up until after 30 days of your initial procedure when the skin is considered to be healed. 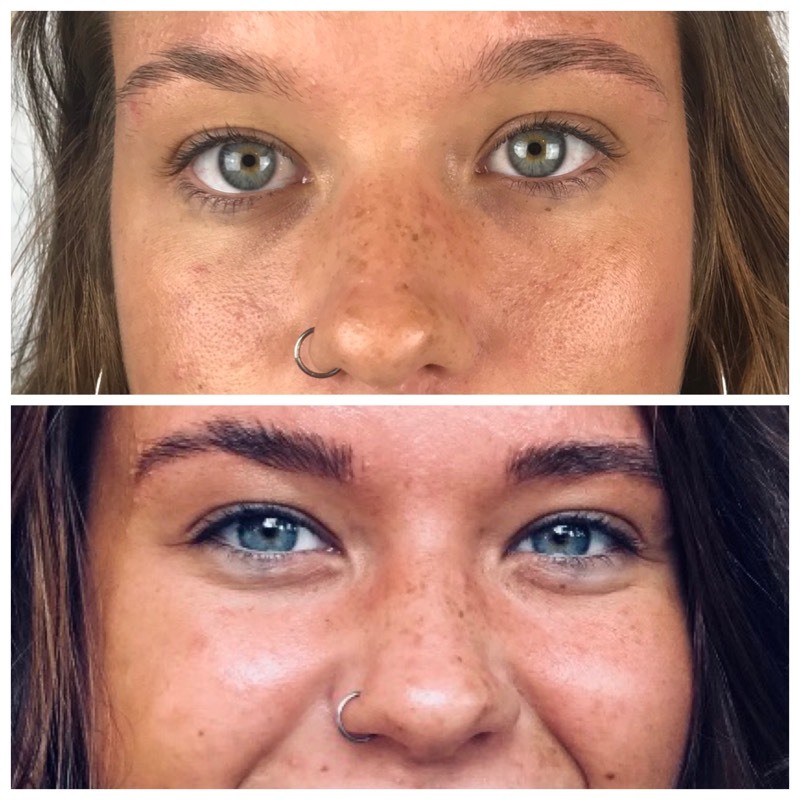 Touch ups serve the purpose of filling areas that did not retain the ink as others, to obtain a darker color or to prolong the life of the microbladed area. There will be slight fading, after 3-6 weeks of healing, the color you see is most likely the color it will remain. Touch-ups or color boosts are recommended over time. Individuals with oily skin will most likely need touchups more frequently. 1Individual results may vary. 2All manufacturer claims, in regards to the benefits, process, length/effectiveness of treatments, how soon you’ll see results or heal, or claims of minimal side effects such as minor redness or mild discomfort or no downtime, are provided by the pharmaceutical manufacturers as part of their guidelines in promoting their product and are backed by case studies/peer-reviewed publications and are published on their individual websites. 3Testimonials are the opinions of real clients that wanted to provide them and express their opinion to others. When written, the only editing done was to fix minor grammatical/syntax errors and/or to truncate extended testimonials that, while nice, went a bit long. Video testimonials are unedited. 4Treatments and services that are time-related (such as fees per a “20 minute session”) are rooted in the fact that most appointments (i.e. the historical average amount of time required to complete most areas we treat) take that amount of time; however, it may be recommended or advised or necessary that more than one session time is required to achieve whatever affect you’re looking for (such as someone wanting to treat many areas of their body vs someone simply wanting to treat their hands). A quick consultation in our office will provide you the exact time required to treat whatever you wish since treatment areas have a direct impact on time required to treat such areas. 5Superlatives, when describing services/products, are manufacturer claims and, in the end, it’s your opinion as to what service/product is right/effective/best for you. 6Internal comparison claims comparing one technology to another (such as stating that a new product is x% better than the previous model, similar to how a 2018 model vehicle has many advances/improvements over a 2010 vehicle), when comparisons are done within the same company’s lineup, are the manufacturer’s statement-of-fact and reflect the latest science and/or breakthrough that, when released as a product, is the best/most effective at the time within their own product lineup — they are not claims comparing their product against other manufacturers’ products. 7Videos, which we have chosen to add links to on our website, are either local television coverage pieces or third-party videos that we feel are great for learning and gaining an overview of the process of several services we offer; but third-party videos (e.g. those in the public domain, such as YouTube) in no way should be construed as an endorsement of Nuderma Health and Med Spa and/or our services specifically. They are meant as an awareness tool to help you decide upon common treatments provided by Nuderma Health and Med Spa and med spa providers nationwide. Some videos are produced by the pharmaceutical manufacturers and others are by service providers.